When Wayne Wolfe discovered that infamous serial killer Ed Edwards was his estranged grandfather he became compelled to answer one potentially life-altering question - are killers born, or are they made? In Paramount Network's "It Was Him: The Many Murders of Ed Edwards," premiering Monday, April 16 at 10:00pm ET/PT, Wolfe joins former Sergeant Detective and FBI Cold Case Task Force Officer John Cameron on his quest to prove that Ed Edwards is the man responsible for some of most astonishingly high-profile murders of the 20th Century. From the Black Dahlia to JonBenet Ramsey, Laci Peterson, the Zodiac killings, and "Making a Murderer" victim Teresa Halbach, Cameron has the evidence to suggest there is no case too nefarious to be Edwards' doing. A calculated and convicted killer, Edwards was arrested in 2009 and found guilty of five grisly murders over 20 years. He died of natural causes in prison in 2011, four months before his scheduled execution. Shortly after Edwards' death, Wolfe learned of his grandfather's identity and his potentially gruesome lifestyle. It Was Him: The Many Murders of Ed Edwards was released on Paramount 374d ago in the US. 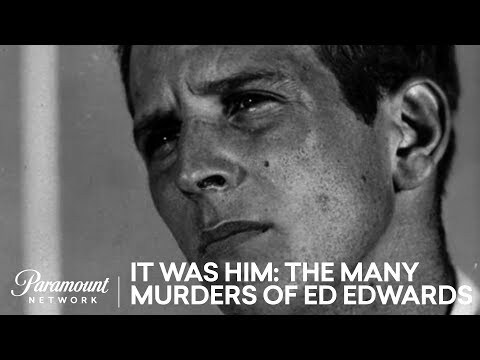 Notify me when It Was Him: The Many Murders of Ed Edwards is available.